Arkansas River off of U.S. 50. This is a popular kayaking area, at least based on the number of kayakers we saw. The Arkansas River is a major tributary of the Mississippi River. The Arkansas generally flows to the east and southeast as it traverses the U.S. states of Colorado, Kansas, Oklahoma, and Arkansas. The Arkansas from its headwaters down to the 100th meridian west formed part of the US-Mexico border from the Adams-Onís Treaty (in force 1821) until the Texas Annexation or Treaty of Guadelupe Hidalgo. At its headwaters, the Arkansas runs as a steep mountain torrent through the Rockies in its narrow valley, dropping 4,600 feet (1.4 km) in 120 miles (193 km). This section (including The Numbers, Brown's Canyon, and the Royal Gorge) sees extensive whitewater rafting in the spring and summer. At Cañon City, Colorado, the Arkansas River valley widens and flattens markedly. 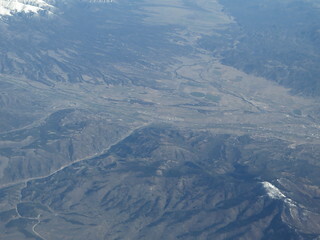 Just west of Pueblo, Colorado, the river enters the Great Plains. Through the rest of Colorado, through Kansas, and through northern Oklahoma to Tulsa, it is a typical Great Plains riverway, with wide shallow banks subject to seasonal flooding. Tributaries include the Canadian River and the Cimarron River (both flowing from northeastern New Mexico) and the Salt Fork Arkansas River. Since 1902, Kansas has claimed that Colorado takes too much of the river's water, resulting in a number of lawsuits before the U.S. Supreme Court that continue to this day, generally under the name of Kansas v. Colorado. The problems over the possession and use of Arkansas River water by Colorado and Kansas led to the creation of an interstate compact or agreement between the two states. While Congress approved the Arkansas River Compact in 1949, it did not stop further disputes by the two states over water rights to the river.